perceptionsense: How Do Animals See In The Dark? All vertebrates have eyes that include pupils. As we know, the iris of the eye expands and constricts the pupil to control how much light passes through. 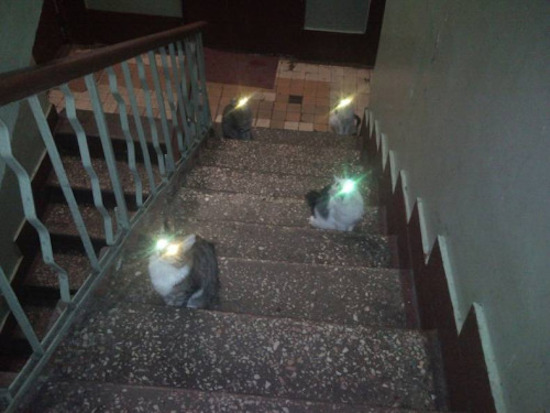 As a cat owner I have always been curious to know how my cats could see in the dark. For humans it takes at least ten minutes for our eyes to adjust to darkness, but for animals like cats and owls their physiological aspects allow them to adjust much quicker. If you have ever took a flash photo of your cat looking directly at the camera you might have noticed that yellow fluorescence that engulfs their eye. That fluorescence is a mirror-like layer located behind the retina called the tapetum. The tapetum allows nocturnal animals to see in the dark because light passes through the retina and then bounces off the tapetum where it makes contact with the retina once again, giving the retina another chance to process the image. As humans we have 120 million rods and 6 million cones, for nocturnal animals their eyes hold mostly rods and only few cones, also allowing them to see in the dark better. So now you know... playing hide and seek in the dark with your cat is not a good idea, as they will most likely always win.